A late rally from Inter Milan toppled Tottenham in the opening match of the Champions League Group stage last night at the San Siro. Christian Eriksen gave the visitors a lead just minutes into the second half, but Mauro Icardi equalised five minutes from time. The late turnaround was completed as Matias Vecino nodded in a winner in stoppage time. For Spurs, three consecutive defeats in all competitions have led to a real concern all around North London. Kieran Trippier and Toby Alderweireld were both left at home as Mauricio Pochettino made 5 changes. Serge Aurier deputised for Trippier and Davinson Sanchez came in for Alderweireld. Further changes saw Ben Davies replace Danny Rose, whilst Heung Min Son and Erik Lamela came back into the side for Harry Winks and Lucas Moura. Although similar patterns emerged from the last few games, Spurs made more chances in the first half. They were at times poor in possession again but looked most likely to score. Notable opportunities included an Eriksen free kick which was palmed away by Samir Handanovic. Harry Kane also rounded the Slovenian cleverly, but couldn’t find the finish from a tight angle. In the second period, Spurs were on top as Eriksen went close again, with a low effort which was kept out by Handanovic. However, the Dane wasn’t to be denied, as he gave Spurs the lead with a deflected strike in the same move. 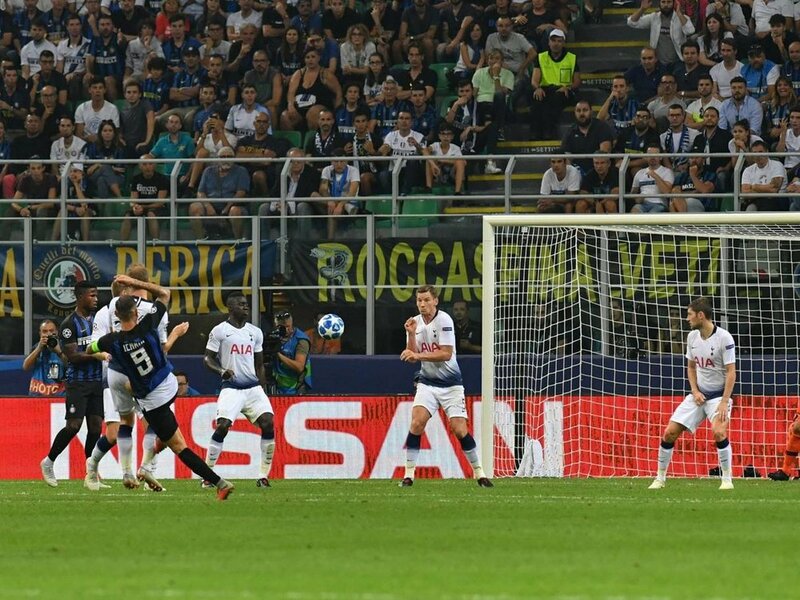 Erik Lamela picked him out on the edge of the area, and his strike was aided by the deflection from Miranda, and the ball looped in over Handanovic. The goalkeeper got a touch, but the ball was too high for him. Inter were building some momentum, and a few chances were missed. They levelled five minutes from time, as Kwadwo Asamoah played a ball in from the left towards Icardi on the edge of the area, in a central position. The Argentinian relied on his fantastic technique to powerfully volley the ball low in to the bottom left hand corner, beyond Michel Vorm. Inter were level, and even looked most likely to win the game. They were able to so, in stoppage time. A corner was whipped in and Stefan De Vrij headed the ball into the six-yard box, and Vecino got there before Harry Winks to power a header into the left-hand corner. For an Inter side who currently sit 14th in Serie A, this result could turn their early season woes around. The win was crucial, especially with it being their first Champions League tie since 2012. They travel to Sampdoria on Saturday, and have PSV next in the Champions League. In an outcome similar to the one at Vicarage Road, Spurs lacked the character to hold on to a lead, and even collapsed at the end to lose again. The third defeat in three consecutive games in all competitions, is the first time that this has happened since Tim Sherwood’s reign, in 2014. Pochettino’s damaged side travel to Brighton on Saturday evening in a must win match. They take on Barcelona next in the Champions League, and this result has already put them behind in proceedings.